I was out at the Target in the next town over from me looking for a new glass water bottle. Didn't find one... but I did stumble upon a re-pack product that I had never seen before! I was a little conflicted on whether to buy it or not as my last re-pack left a pretty sour taste in my mouth. But this one was cheap enough, and had a product that I would actually consider buying at retail (UD Series 1) showing through the window. I went for it. The front of the box states that there are four packs, 50 cards, and a bonus to be found within. Two of the packs were already revealed through the front and back clear windows on the box. That was enough to entice me into getting this re-pack. At $7.99 it was a bit hard to resist. Getting four packs here was cool, but I was really more intrigued by the 50 bonus cards. Would they be a factory sealed set of cards or a random assortment? The last re-pack disappointed me by just giving me an old Bowman factory set. I hoped that it would not be something like that with this one. Going through this little box of cards was more fun than I thought it would be! It was just about the opposite of my experience of my last re-pack purchase. First of all, the pack selection surprised me. I knew that I would be getting an Series 1 pack and an OPC pack, but I didn't expect to see another Series 1 pack within. Upper Deck Series 1 packs are always great to see because the chances of getting a Young Gun rookie card is actually within the realm of possibility (unlike trying to pull a jersey or autograph out of retail). Though I did end up getting two Series 1 packs, neither of them had a Young Gun inside. 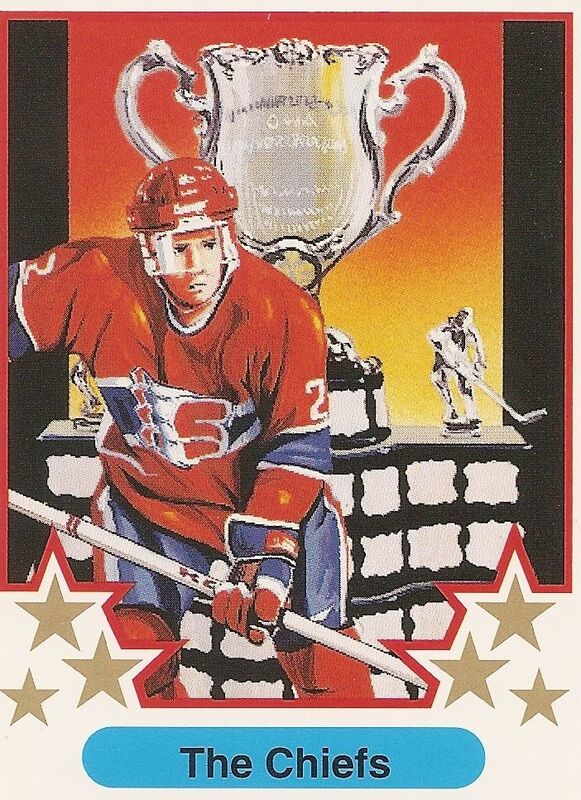 I did manage an Yzerman Hockey Heroes card though - that's better than all base I suppose. More exciting than the packs was the cardboard box inside. The box contained an assortment of random cards to look through. Obviously, there would almost never be anything of worth there, but the fun of seeing what's there is what getting one of these is all about. And I did have a blast going through the 50 assorted cards. No big money hits or rare cards... but plenty of big names were there for me. Many of these cards actually brought back memories of when I bought them as a kid. The 93/94 Leaf cards were especially nostalgic as I bought a lot of those when they were first released. It was a great set that year with a great design on both the front and back of the card. The only real disappointment with this box was the 'bonus'. The 'bonus' was a single foil card of Jose Theodore tossed in amongst the packs outside the cardboard box. There was no sleeve or any sort of protection for the card - it was just there. I guess whoever repacked this box didn't have much regard for the bonus content! This has got to be one of the ugliest and flimsiest cards I have ever seen. It's one of those 'it's so bad it's good' kind of things in this case. I laugh when I see these cards because there were companies with the audacity to put out stuff like this in the past... and not 50 years ago past... 1991! Well, I guess 1991 was a pretty long time ago - and there was a lot of junk that came out during those early nineties years. This card was incredibly cool for me to find in this box. I had this exact card as a kid. I remember trying to track down and trade for all the Sharks from this set. 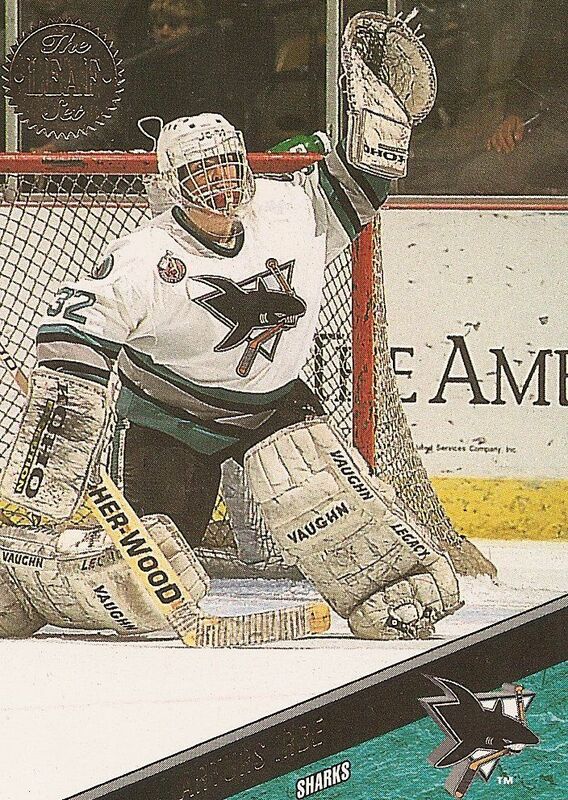 Irbe was definitely THE MAN back in the early years of the Sharks franchise. 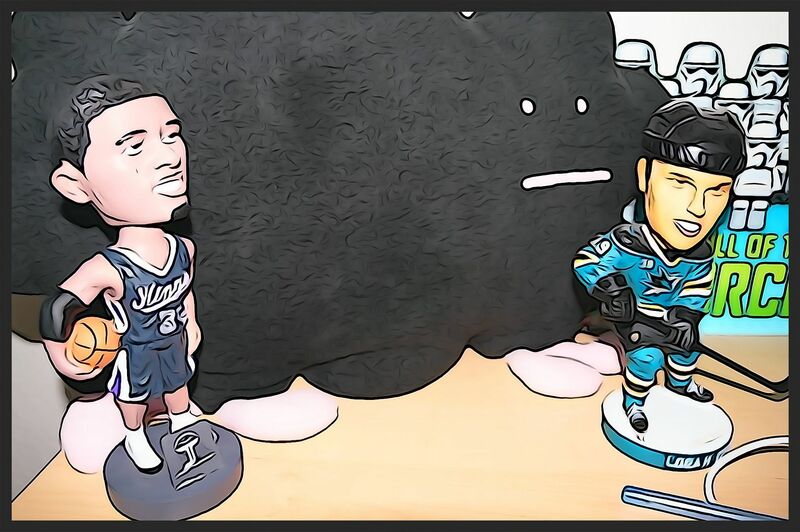 I'm always glad to get cards of his in a Sharks uniform. The Dominator! It was hard to me to pick between Hasek and Irbe in terms of which card would get top honors this week... but I had to got with Hasek. He was an incredible goalie, one of the best ever. 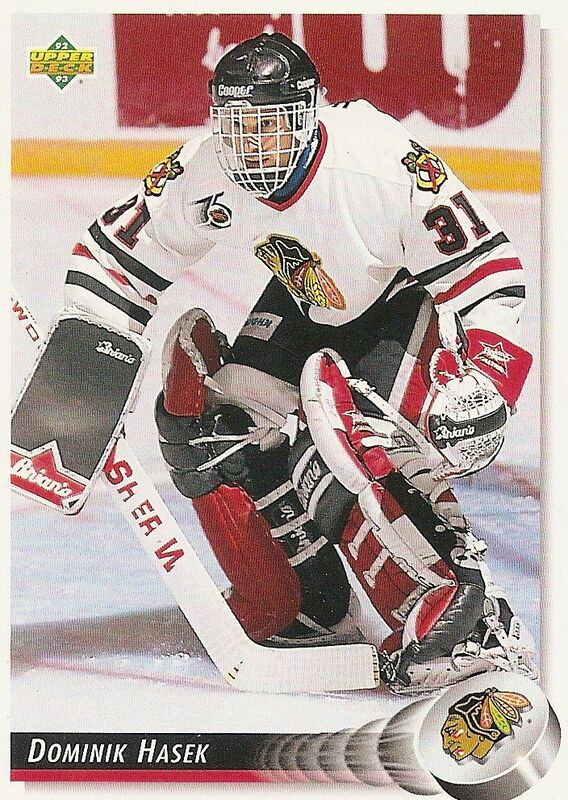 It was always amazing to watch his unorthodox style of net minding. He was also awesome as a goalie in the old NHL '93 Sega Genesis game that I loved playing. He won a lot of games for me! This is one of the first times that I have been somewhat impressed by a retail re-pack. At the $7.99 price point, I would have no qualms about giving another one of these a shot. 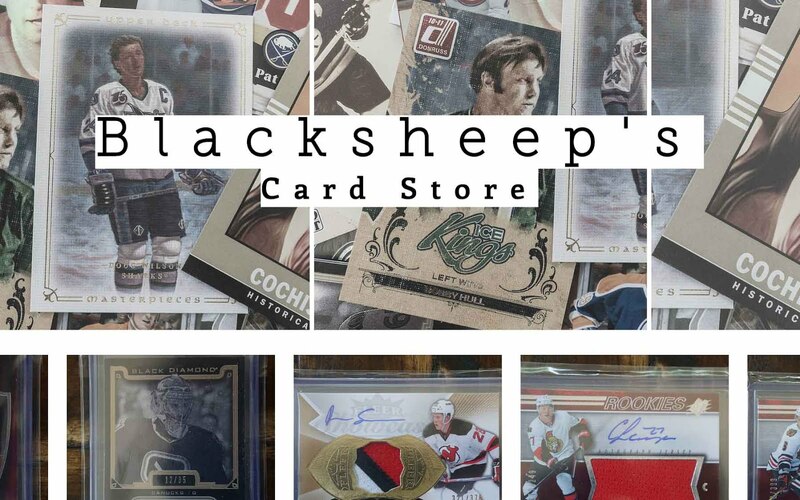 I feel that this particular type of repack has potential to yield something of value, and it also brings the enjoyment of going through a stack of older hockey cards - really fun stuff! Let me know what you thought of my Target Re-pack in the comments section. Have you ever gotten anything of note in one of these things? For $7.99 thats a really nice break. The bonus wasnt bad usually it is a pack of MVP or Victory. The 50 cards was a nice variety really suprised by that. I have bought re-packs before when I was a kid and usually it was all Bowmman. 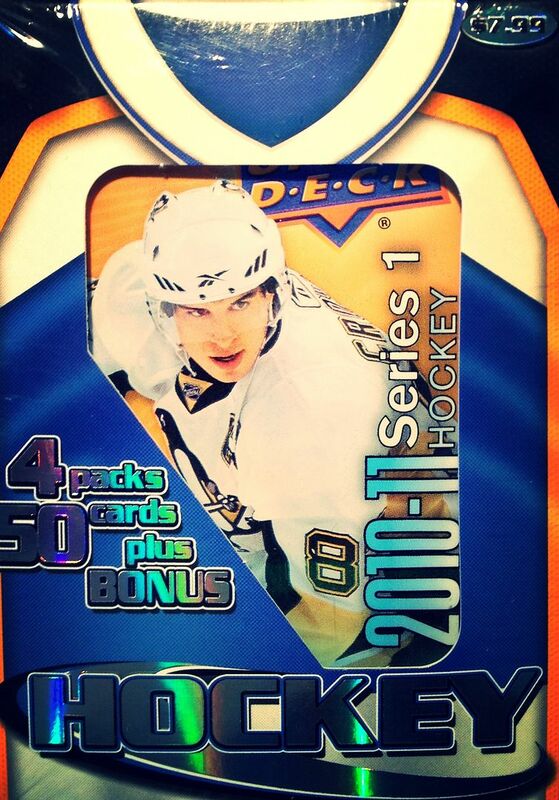 As for the packs 2 Upper Decks are nice to have and you only go shutout on 1 pack. You may have to find another one of these for a later episode. Of course you don't go in getting this box thinking you will be getting a huge hit. But it is very enjoyable especially for the price. This is something I would love to bust every now and then. It seemed that you had fun too which is great! 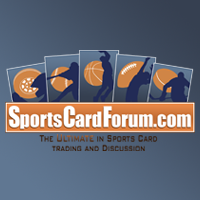 Keep up the awesome breaks and reviews!